BELLINGHAM, Wash. — There are devices that scan your fingerprint, read your retina and face, recognize your voice, and identify you using the veins in your palm. So why not the ear? 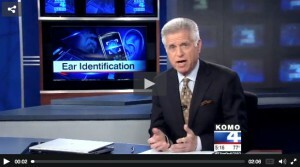 Descartes Biometrics in Bellingham has developed Ergo, an app for Android smart phones that uses your ear as a password. “The human ear is as unique as the human fingerprint,” said CEO Michael Boczek. Boczek believes the ear can unlock not just a login for smart phone, but a future for the startup company, especially if the banking industry becomes interested. The app takes advantage of the pressure and touch sensitive glass screens on Android phones.